In July 1930, the M.G. Car Co. Ltd was registered to take over the production of sports cars from The Morris Garages Ltd, in a factory in Abingdon. 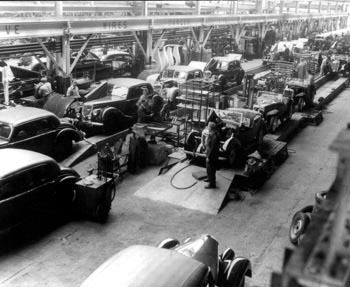 The Nuffield Organisation and Austin Motor Co. Ltd. merged in April 1952 to form the British Motor Corporation (BMC). This brought the Austin, Morris, M.G., Riley, Wolseley and Morris Commercial marques into common ownership. This Cyclemaster Roundsman was used as a factory runaround by the Morris/MG parts dept, and was found and purchased by a local enthusiast when the factory closed in 1980. Below, you can compare the MG factory Roundsman with the article introducing the Roundsman to the public. I’ve owned – and built up – a few different Roundsmen. The heavy-duty frames of trade bicycles are particularly suitable for mounting auxiliary engines. And the Cyclemaster Roundsman provides interesting insights into the postwar period up to 1955, when new vehicles were unavailable due to the mammoth export drive – foreign exchange was desperately needed to repay Great Britain’s war debts to America. Cyclemaster was the only company to provide a unit that was already motorized. As I’m sure you already know, in 1955, the ‘mo-ped’ made its debut and killed off the cycle-attachment engines that had been so indispensable to help mobilize Europe after the war. This Cyclemaster Roundsman is in superb original condition. It’s by far the best one I’ve ever seen. Compare it with my restored Mercury Cyclemaster, below.